One common machine that will be found in most break rooms across the nation is the vending machine. These machines are stocked with snacks of all varieties, and consumers input a few coins to get a tasty snack that will take the edge off of thirst or hunger. However, vending machines are traditionally stocked with food and drink items that have virtually no nutritional value. Soft drinks, salty snacks, sugary candy, and other vending machine staples can actually increase hunger and reduce energy. By filling your break room's vending machine with healthier alternatives to the junk food found in most machines, you can improve the health, energy, productivity, and success of your students or employees. Filling your vending machines with whole grain snacks and energy bars is a great alternative to salty potato chips, enriched flour crackers, and pretzels. Whole grains pack more of an energy punch, and they won't leave students or employees feeling drained of energy. 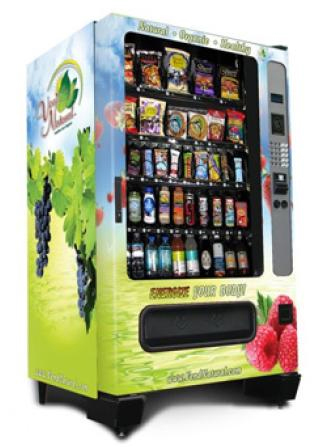 Specialty vending machines with a refrigeration component can be used to dispense healthy snacks such as individual containers of yogurt. Yogurt has actually been shown to have a weight-reducing effect when consumed in moderate amounts, and the active bacteria cultures in yogurt can improve the health of the digestive tract. One trend that is being implemented in many schools and public buildings throughout the world is the inclusion of fresh fruits and vegetables in a vending machine. These items often require the use of a refrigerated vending machine, but you can also find prepackaged vegetables or dried fruits that can be put into a traditional vending machine. Fruits and vegetables are loaded with nutritional content, and they don't contain all the empty calories and carbohydrates that are common in snack foods like potato chips, pretzels, and candy bars. Including a few healthy vegetable and fruit options can dramatically increase the overall health of your employees or students. It can also increase productivity amongst employees, as fruits and vegetables offer sustainable and long-lasting energy that cannot be attained from salty, sugary snacks. Instead of filling a beverage vending machine with soft drinks that are loaded with sugar and calories, consider offering healthier options like fruit juice or vegetable juice blends for the health-conscious consumer. A break room is intended to be a place to relax and refuel. However, consuming a soft drink like soda will actually drain the body of energy and create an exhausting sugar spike scenario. Vegetable and fruit juice blends, unless loaded with excess sugar, are a great alternative that can provide long-lasting energy to get students and employees through the work day successfully. Vending machines have long been considered the enemies of a healthy diet. However, new products that fit snugly into vending machines can actually be healthy and beneficial. You may have to do a little extra searching to find healthier alternatives for a vending machine, but the results will be well worth the added effort.